A Soyuz spacecraft carrying NASA astronaut Randy Bresnik, cosmonaut Sergey Ryazanskiy and Italian astronaut Paolo Nespoli docks with the International Space Station on July 28, 2017. The Soyuz is a type of spacecraft that the Soviet Union, and then Russia, has used for decades to launch cosmonauts into space. Today's Soyuz missions are best known for trips to the International Space Station; however, the spacecraft has a long operational history dating back to the 1960s, starting with its first uncrewed mission on Nov. 28, 1966. Over the years, Soyuz spacecraft have sent cosmonauts to several types of space stations — the Almaz series, Salyut series, Mir and today's ISS. Soyuz had two fatal missions. In 1967, the first crewed Soyuz mission, Soyuz 1, ended in tragedy due to a parachute failure that killed its sole cosmonaut, Vladimir Komarov. The first three-person Soyuz, Soyuz 11, in 1971, also had fatal consequences for its three crewmembers (who weren't wearing full spacesuits) after the cabin lost pressure shortly before re-entry. As of mid-2018, Soyuz spacecraft are the only form of transportation to take astronauts to the ISS, because NASA has no operational spacecraft since retiring the space shuttle in 2011. However, NASA is supporting the development of two commercial crew spacecraft (Boeing CST-100 Starliner and SpaceX Dragon) that are expected to begin uncrewed test flights in 2018 or 2019. Soyuz spacecraft are launched atop Soyuz rockets, a line of Russian boosters that have seen variants fly since the mid-1960s. Soyuz is a single-use spacecraft designed to carry three inhabitants for several weeks, although today most crews use them for just a few hours or days in between six-month stays at the space station. The spacecraft includes an orbital module for missions; a re-entry module to come back to Earth; and a service module that has engines, instruments and other necessities to run the mission. Crews breathe an oxygen/nitrogen mixture that is at partial atmospheric pressure compared to Earth. Soyuz has gone through about 10 variants since the 1960s. The most recent variants include Soyuz-TM, used for missions to the Mir space station, and three versions used for the ISS: Soyuz-TMA (retired in 2012), Soyuz TMA-M (retired in 2016) and Soyuz MS (in service since 2016). The current version, Soyuz MS, has a height of 24.5 feet (7.48 meters) and a maximum diameter of 9 feet (2.7 m), according to manufacturer RKK Energia. The solar panels extending from the module span 35 feet (10.7 m). Notably, the Chinese Shenzhou crewed spacecraft uses the same technology as the Soyuz TM, although the spacecraft is not directly related to the Soyuz line, according to The Guardian. Russian cargo spacecraft called Progress, which are used to service the ISS, are also derived from the Soyuz. The first few spacecraft missions were Soyuz 1 through Soyuz 11 (1967-1971). While this generation encompassed several Soyuz spacecraft types, they tend to be grouped into one generation because they used bent solar panels (unlike future generations of Soyuz) and also had an automatic docking navigation system. Of note, Soyuz 11 docked to Salyut 1, the first Soviet space station. The Soviet Union also designed a variant (Soyuz 7K-L1) to bring cosmonauts around the moon; the design was tested with several uncrewed Zond missions that collected data on nearby celestial bodies such as the moon. The second generation of Soyuz was used for Soyuz 12 through Soyuz 40 (1973-1981), according to Aerospace Technology. Cosmonauts in these spacecraft docked with the Almaz (military) and Salyut (civilian) space stations. This generation also included the Soyuz 7K-TM spacecraft, which docked with a U.S. Apollo spacecraft during the Apollo-Soyuz Test Project in 1975. The third-generation Soyuz-T (1976-1986) had solar panels that gave the opportunity for longer missions, according to Aerospace Technology. These missions commonly visited the Salyut series of space stations. Notably, Soyuz T-10a was supposed to visit the Salyut 7 space station in 1983, but the launch escape system fired and saved the crew from a launch vehicle explosion. The fourth generation of Soyuz vehicles were used to visit Mir (in the case of Soyuz-TM) and the International Space Station (for Soyuz-TM, Soyuz-TMA and Soyuz-TMA-M and Soyuz MS), according to Aerospace Technology. The latest version, Soyuz MS, includes changes such as more efficient solar panels, a more fuel-friendly approach and docking system and a new computer. The Soyuz MS-02 spacecraft made its first flight on Oct. 19, 2016, with the Expedition 49 crew on board. 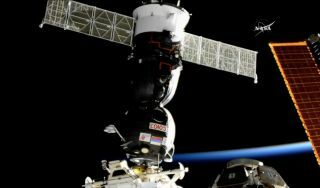 Demand for Soyuz spacecraft is expected to drop precipitously around 2019 or 2020 when the United States resumes crewed flights from American soil, according to SpaceflightNow.com. Currently, NASA pays Russian space agency Roscosmos tens of millions of dollars per seat to regularly put American astronauts aboard flights. This revenue stream will diminish as American spacecraft become more available, although Soyuz flights will likely continue with Russians on board. The ISS is expected to cease operations around 2024 or 2025, as the Trump administration has requested no funding for the orbiting complex in 2025. Currently, the international partners in the space station agreement are discussing a new lunar space station called the Deep Space Gateway. This would send astronauts (and possibly Russian cosmonauts) to missions near the moon, providing practice for longer-term missions to Mars and other locations in the solar system.